This post contains spoilers for specific plot points throughout the HBO series Game of Thrones, and is current through Season 8, Episode 2, "A Knight of the Seven Kingdoms." Visit our official hub for our episode ranking, show recaps, ending theories, and more. So many characters turned up in the Game of Thrones final season premiere, and so many big moments happened, from Jon Snow learning his fate by birth (and riding a dragon) to that fiery, little performance art from the White Walkers, that you might not have noticed who wasn't involved. The Night King, for one. And Melisandre is AWOL. But the biggest absence in our book: Ghost. Oh, really, Joe? Then where was he in the premiere??! 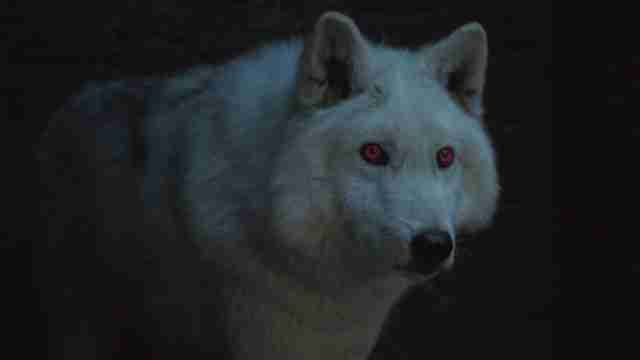 Though Ghost had been ghosting us since Season 6, fans assumed that he was still alive like Arya’s Nymeria, as they’re the only two wolves who remain (RIP to Sansa's Lady, Robb's Grey Wind, Bran's Summer, and Rickon's Shaggydog) from when each of the Stark siblings took in a pup of their own back in Season 1. The Stark family has been synonymous with their direwolves, the imagery of their house sigil, since the beginning, and they've always been integral to their growth and safety. But the fate of the two living creatures -- not unlike the rest of the Thrones cast -- has at times been a murky, with the wolves often MIA, although Nymeria and Arya had a poignant reunion in Season 7. So, when Jon returned to Winterfell in the Season 8 premiere, and his loyal, four-legged friend was nowhere to be found, some went so far as to speculate that Daenerys' snow-white coat looked a little too close in color to the hue of Ghost's fur and that's where he’s been -- although Bauer did stress "he's very present and does some pretty cool things in Season 8." 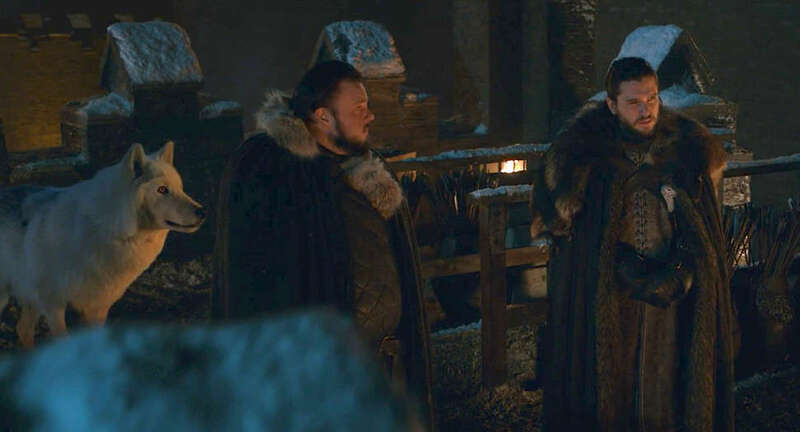 Thankfully, Ghost did not end up as canine couture, as he was briefly glimpsed during a scene in the second episode of Season 8 standing with Jon Snow, Samwel Tarly, and Edd Tollett discuss how far they've all come while standing on the ramparts of Winterfell. We can all rest easy... for now. 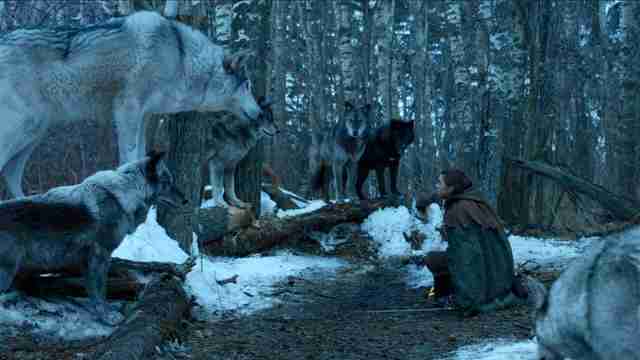 Ghost and Nymeria appear so infrequently largely because of filming logistics more than anything. Even though most series might opt into CGI to design its fantastical critters, this is Game of Thrones here, meaning there's no way in hell the HBO saga isn’t going to film without some real wolves -- and that's no easy feat, given that direwolves are considerably larger than their real-life counterpart. There may be a lot of lose ends to tie up in Game of Thrones' final season -- like how Jon (erm, Aegon Targaryen) is going to come to terms with his true familial lineage, and how the impending showdown with the Night King's army of the dead is going to go -- but one thing is for sure: Fans don't have to worry about any canine cliffhangers. One can only hope Ghost will help take down the Night King, or maybe even take his rightful place on a pup-sized, doggy bed throne of his own. And we'd pay money to see Ghost ride a dragon.